Blog > How To... > 8 time saving tips for knitters! It’s coming up to that time of year when the clocks go forward and we lose a precious hour of knitting time! We’ve found you some time saving tips to get more knitting into your day! This month, all around the world, we’ll be moving our clocks forward an hour to make the most of the daylight — but this means we lose an hour of knitting time! We’ve been finding some super time-saving tips to help you maximise your needle clicking! 1. Check your knitting style: English or Continental? If you watch a fast knitter knit, you may well note that their hands don’t move very far. If you knit English style and “throw” your yarn, the motion you use to take your working yarn over the needle doesn’t need to be flamboyant, simply functional, so check your moves and see if you can save time but shortening your actions. Hazel Tindall, the fastest knitter in the world knits English style but is very economical with the movement of her right hand, hence her phenomenal speed: 262 stitches in three minutes! 2. Download the LoveKnitting app! Making sure you’ve got everything in one place will save you time when you’re working on a pattern, so instead of having to carry a pattern around with you, or print one off, install the fabulous LoveKnitting app and keep all your detail in one place! You’ll be able to keep track of exactly where you are in a pattern, build collections of your patterns and work lace and colour charts more easily with the app’s built-in rulers! At the moment it is available for iPad or iPhone, but versions for other platforms are under construction! You can download the app here! 3. Teach yourself to knit without looking! Teach yourself to knit without looking! Start slowly with knit stitch, and try to look away while you knit a few stitches, making your fingers feel their way along the needles. Keep practising, like playing the piano, until your fingers have retained the muscle memory to knit all on their own! Once you’ve mastered the knit stitch, teach yourself purl and rib without looking! Begin with something short and simple, and memorise your stitch patterns. A 2 x 2 rib is easy to remember, but begin by trying simple lace motifs or patterns that require one or two rows of repeats. Feather and fan is a lace pattern that might repeat a sequence like this: *K2tog, k2tog, yo, k1, yo, k1, yo, k1, yo, k2tog, k2tog, repeat from * to end – you’ll save yourself time by memorising that stitch sequence rather than having to stop and look down at a pattern every time you repeat it. You’ll be amazed at how fast you remember these sequences! Once you start stretching your memory muscles like this, you’ll find it easier to remember stitches in every pattern you knit! 5. 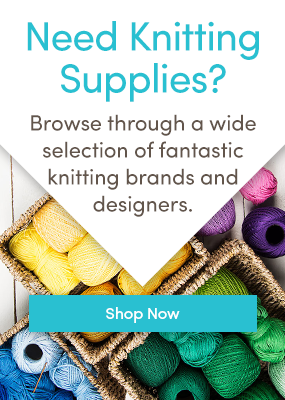 Joining new yarn and weaving in ends as you go along! Try, if you can, to join new yarn at the beginning of a row – unless you are meticulously neat and can felt or friction join your ends together (with feltable yarns). This will help you to weave your ends into a seam, or perhaps a rib, and keep them hidden away. We suggest you weave your ends in as you go along to save time at the end of your project! Read more about ways to join yarn in our handy blog post! Use the right needles for the right kinds of yarn. Slippery yarns with silk, cotton or linen content can often slip on metal needles, so try bamboo or wood to get a better grip. Conversely, stickier yarns, like mohair or thick and thin yarns knit faster on metal needles! Knitting on circular needles is economically faster due because you have less need to be constantly stopping and turning your work – so if you haven’t tried them already, take some circular needles for a spin! 7. Read the pattern before you start! This might seem an obvious tip – but reading your pattern all the way through before you start will save you hours of flicking back and forth later! Check for techniques you might need to learn before you start; make sure you have the right needles, you don’t want to get half way through and realise that you need a smaller needle for a button band or cuff and have to go shopping! The same applies to yarn, make sure you’ve got enough so that you don’t run out and waste time having to find more! The brilliant Amy Kaspar is here to tell you all about the ingenious lifeline – thread some yarn or better still, dental floss, through your knitting at various points to make sure that if you go wrong, you can frog back to a place of safety! What are your time saving knitting tips? We’d love to hear them! Tell us in the comments! Last updated: March 29th, 2017. 12 Responses to 8 time saving tips for knitters! I always use 2 row counters. One for the patterns repeat that I attached with a pin or to the yarn tail and one on my needle for the row count. Find this saves time when working on projects with a lot of pattern repeats. Use to mark it down on paper, but somehow kept losing pen. Think the gremlins that eat the stitch markers, like the pen also. I’ve heard that dental floss can actually cut through fine yarns. Wonder if it’s true. For complicated patterns I copy each row on to a separate piece of card with a hole at one end and thread them on to a split ring in row order.. Then instead of a row counter I just turn the top card over at the end of the row and hey presto the next row instructions are there without having to search the pattern sheet. Brilliant!! I’ve used the sticky note method, but my cats like to play w the paper; and, the tend to run away with it. I could put an elastic around the cards if I had to leave it. I use post-it slips to underline the row I,m currently knitting especially if it’s a complicated pattern. It’s so simple to just move it down onto the next row and the iridescent colours show up well against the white pattern paper. Is there a pattern for this clock? How can I find it? I use a child’s wooden abacus to keep track of anything that needs counting. 10 rows of 10 beads, and all you need to do is flick a bead across with the end of your needle to count rows or pattern repeats. You can have more than one count on the go at a time using different rows, and you can preset groups of beads for eg ‘repeat last 4rows 6 more times’. Most useful tip I’ve ever had, from the late and wonderfully creative Margrit of Morehouse Farm. Be very careful with dental floss or can cut your yarn. I use # 10 crochet thread. Same feel no cut yarn. I use color for making large lace charts easier to read. I leave the knit stitches uncolored, use dark grey for purl stitches, yellow for YOs, red for K2tog, blue for SSK, etc. Often I just use colored pencils to color in the pattern (in a book or magazine,) but if necessary, I reproduce the chart using a Publisher table grid and then just turn each square the appropriate color. It takes a while, but a color chart is much easier to read and it gives you a visual approximation of the pattern.